Remakes seldom come with as much Hollywood heft as A Star Is Born. Carrying a legacy almost as old as the cinema itself, this new version comes with its own added baggage of risk: it’s the big screen debut of global superstar Lady Gaga as the eponymous emerging talent and Bradley Cooper takes his first singing role and takes on his first directing duties. But none of that pressure can be found on the screen. Instead, this update of the classic love story is crafted with a palpable affection and passion. Cooper’s take is personal, ingenious, and raw. In an attic hideout, young Miguel not only hides a stash of memorabilia of legendary musician Ernesto de la Cruz, but also his own secret longing to become a musician himself. Trouble is, his small village life in Mexico is already predetermined to follow in his family tradition of making shoes and shunning music. But the discovery that Cruz is the great-great grandfather that abandoned the family and spurred their rules against music sends Miguel on a journey to the spirit world to reconcile the two halves of his heart. In so many ways, Coco feels deeply personal. Like the best of John Hughes and the most confident of modern musicals, Sing Street is addictive and rousing. The newly minted high school band at its center may have dreams beyond their Dublin suburbs, but the film only yourns for the audience’s toes to be tapping. Along the course of Sing Street, the central teen’s musical tastes develop from exposure to the various subgenres present during its particular 1985 setting. Naturally, his style changes abruptly to incorporate swabs of makeup, bleached patches of hair, and a nuked mane to mimic the influence of Duran Duran and The Cure on his musical infancy. The specificity lent to the film by the exact moment in (especially British) music actually goes to underscore the timelessness of the film and the transforming power of the artform. That Sing Street can organically chart these seismic shifts happening daily to our hero Conor (a charming and genuine Ferdia Walsh-Peelo) through the lens of music is to be somewhat expected coming from director John Carney. His humanistic approach to character and connection through music have worked previously in Once and Begin Again, with this effort being the best among them. Carney’s characters have always defined themselves through music, but never has he shown more depth to that identification. Like our constantly evolving taste in music and the shifting landscape of popular music, our identities are diverse and mutable, something entirely different from one day to the next. I’ve been playing a lot of catch up the past few weeks, if you haven’t noticed steady updates on the Reviews page. One of the highlights that I dropped the ball on missing in theatres (blame it on a hectic summer) was I’ll See You in My Dreams. 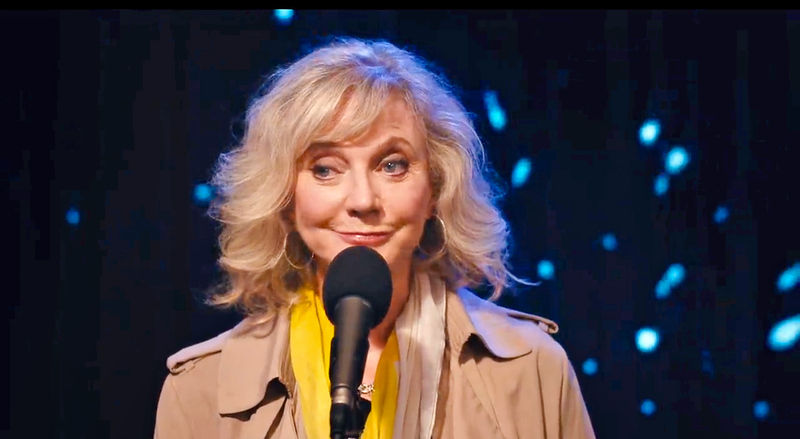 A quiet, unassuming drama about the unexpected new beginnings still available as we age, the film is centered by a subtle and fully realized performance by Blythe Danner. Finally given the chance to carry a movie on her shoulders, Danner reaches deep emotion without showboating and it’s reason in itself to see Dreams. However, the film itself is rich with honesty and unexpected depth for its deceptively light touch. The title song, written and performed by Keegan DeWitt, comes at the end of the film, a delicate coda on the relationship between Danner’s Carol and her surprising pool-boy buddy played by Martin Starr (who performs the tune in the film). It’s a small capsule of the film’s tone and Carol’s melancholy – but not maudlin – state of being.